I've noticed that there is a mental attitude creeping into our lives today that focuses on 'scarcity'. So many of us have a mindset that thinks we're missing out. We don't have as much as other people have, we don't have as much money as we'd like, we don't have as much time as we'd like, we don't get as much sleep as we'd like, we don't get as many lucky breaks as we'd like, and the list goes on. We are always quick to notice the things we think we are missing out on. We lament the windfalls we haven't received and we focus on the lack in our lives. This is such a draining way to view our world. There will always be others who have more (and they are often quick to announce their blessings to the world at large.) There will always be better jobs than ours, better holidays than we can afford to go on, better behaved children, better cooks, better crafters, and better bloggers! In contrast, there is a whole philosophy out there that claims that the opposite to a mentality of scarcity is to have a mindset of abundance. To claim your entitlement to an abundant life. 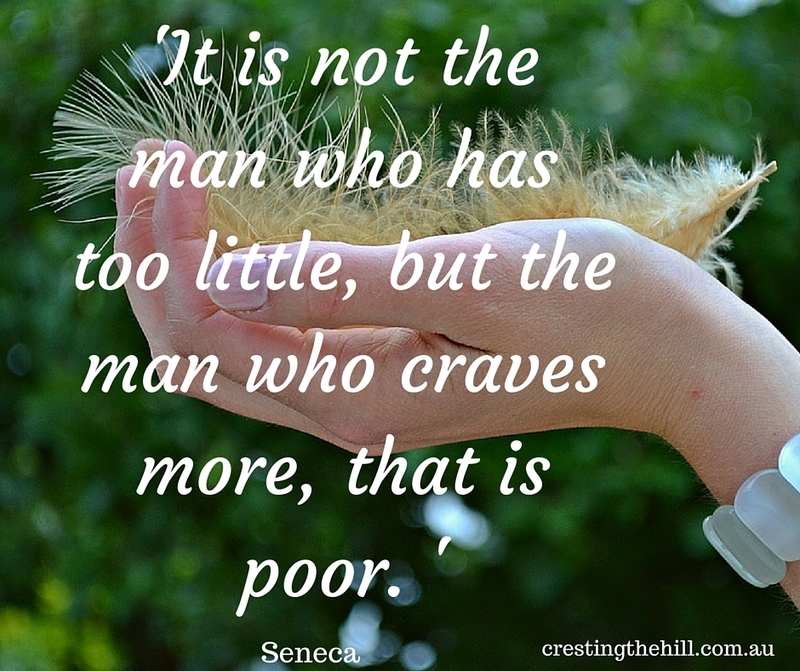 To not settle for having less of anything, but rather to aim for abundance in all things. The idea that if you think of abundance and focus on abundance, abundance will manifest itself in your life and your will have more than you ever dreamed of. The belief that you are entitled to have your every whim and desire met and fulfilled to overflowing. I'd like to suggest that there is a much happier middle ground somewhere between those two extremes of "scarcity and "abundance" and that it is summed up by the word "enough". Instead of constantly craving more, we need to appreciate that we already have more than enough to live a contented life. We need to start being grateful for the "enough-ness" of our lives. We may not have as much as some people, but we have more than enough. If we don't get a handle on this, we will live lives of envy and discontentment and never find the quiet satisfaction of knowing we are blessed in so many ways. We will always be searching for more and even if we get more, there will always be the next thing, and the next until we die. They say that "he who dies with the most toys...wins" but does he really? Maybe he never stopped long enough to enjoy those toys because he was always striving after the next possession or experience. Lets see our dissatisfaction for what it is, and replace it with an appreciation of the "enough-ness" in our lives. Lets be grateful for our blessings and not spend our lives deploring what we think we're missing out on, or what we think we should be entitled to. Lets turn society on its head and say "I have enough thank you". I think the world would be a happier place if we all did that. 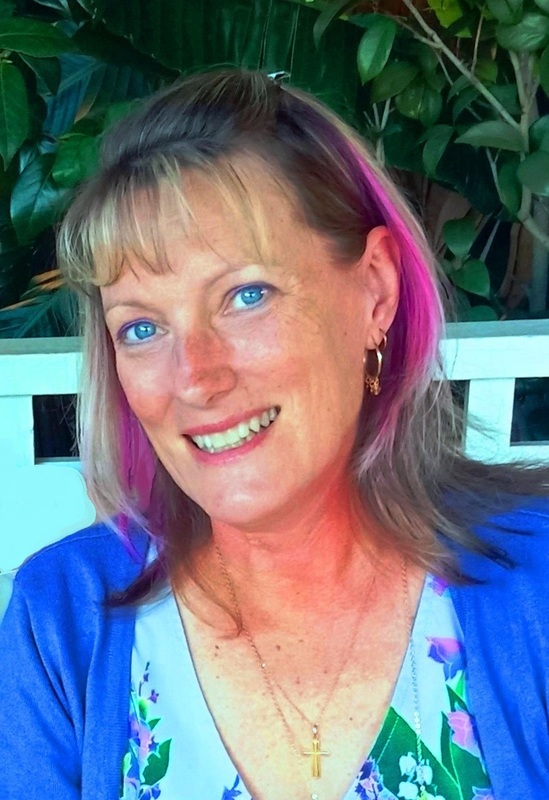 I love this post and mentality, Leanne! I'm always mindful that I could be in such a worse position when something goes wrong. "But for the grace of God, there go I." Thank you for sharing this. thanks for reading it Regina - I can tell that you would think this way because you have an essence of appreciating what you have in life - it's something the world needs more of! thanks for this great reminder - just spoke on contentment in a world of more - and I need to hear it everytime I speak it! blessings! Good gosh I love how you write and your posts always hit me where I need in the most gentlest of possible ways :-) I've been thinking a lot about a poem I read back in college. I was lovelorn and I can't remember what else :-) but one of the lines of the sappy poem was: Even the sun burns if you get too much. Quarter of a century later I think of that often. Sometimes a small taste which leaves me wanting more – – is more than enough. I agree Carla - it always seems that the more you have, the more you want. We are too good at seeing what we don't have and nowhere near good enough at appreciating all that we have already. Important message Leanne! I think we all struggle at times. But as I get older I just want less to manage! me too Pam - less is more is something I quote quite often - it's about appreciation more than anything. YES!! 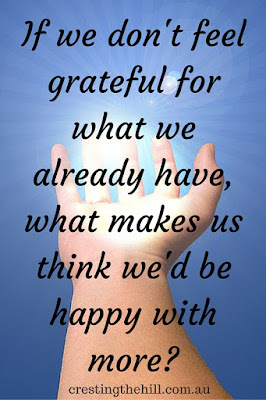 Gratitude for what we have is important. I do think sometimes people have the childish thought of all the things they want and they never change that tune in their head as they mature. They still think every toy, every new thing will make them happier. We call that chasing your tail! I agree Haralee - it seems there's always something new to buy or upgrade or spend your money on. There is always another bell or whistle and ultimately it's just stuff and we need to focus on what is driving us to feel like we haven't got enough already. Absolutely! Ever since I started focusing on the wonderful things in my own life, I couldn't help but notice how much more peace I had. Great thoughts. Peace with yourself is the ultimate end deal Jamie - you are so right! Agreed! Leanne, this is such a wonderful message. I too have noticed the grind, an over abundance of getting and getting more. The hustle. I believe the rise in social media usage is a big part of the problem. We see others well-crafted images of happiness, travel, etc, and we instantly think - I want that. But like I stated, these images are carefully crafted and not the entire picture of life. social media can be a scourge if we let it Glenda - so many gorgeous people doing gorgeous things while we are living our less than exciting lives - we need to take a step back and see that what we have already is often more than those who advertise their lives really have underneath. Mindless consumption, conspicuous consumption are all part and parcel of a disease see a lot of her in America. This began long before social media too. Loooong before it. I think social media just put it even more in our faces Carol - I think the world would be a better place if we all stepped back and took a breath and shut our ears and eyes to the relentless push to have more. I ping pong between these two extremes. I have been thinking of the word "sated" which is "enough" in a more visceral word. I am trying to notice when I feel sated so I can recognize it. I have never had a question about whether the people and things are my life are enough. They are. It is my appreciation that is often lacking. Appreciation is definitely the key Anna - then we are more aware of how much we already have and it is often more than enough. There are times that we need to top up our lives - but nowhere near as often as we are led to believe! This is a really good mindset to have - being happy with what we have first, before we think about what else we think may satisfy us. And appreciating what we do have is key as well. Love your post. Thanks so much Lisa - I think you summed it up beautifully! It's not that we don't need more, it's recognizing what we already have and finding satisfaction with it before looking to what we don't have. I agree Leanne we should take the middle ground. I feel that there is so much pressure on us when they talk about abundance that we can start to feel overwhelmed. I'm happy and appreciate what I have, although I do strive to make the most of every day. Great post! I think making the most out of what we have is part of the secret Sue - it's knowing that we have sufficient and appreciating it and then going out and enjoying it! Unfortunately we currently live in a world where those that don't have enough are taught to blame people who have even less. that is sad but so often true Jennifer - we all need to take a step back and stop blaming or whining and start making good choices and finding some balance. Oh yes! Sometimes I tire of all the bucket lists and kind of want to make a list that rhymes, if you get what I mean. It's wonderful to maximise your potential but sometimes we end up over-reaching. I'm a bit the same Corinne - it's good to have things to look forward to, but they shouldn't consume our lives (or our every waking thought!) Contentment is a wonderful thing! Late last fall I realized that I truly have more than I need. I've been blessed with the life I have and have never truly wanted for anything. I've always been grateful but something clicked when I said it to myself. If we are able to quiet our minds and ignore the pressure, I feel more of us would realize we are enough. Hi Leanne, I love this post. I am happy with having 'enough' in life, in fact I know that we have more than enough to have a good life and I do try and acknowledge that. Life is too short to be competing with the Joneses. I want to be able to stop and smell the roses and appreciate what I see and hear around me, after all the best things in life are free. What a better place the world would be if we were all content with having 'enough'. I couldn't agree more Debbie, the idea of always competing leaves me cold. Life is definitely too short to waste it trying to accumulate more or bemoaning the idea that you don't have as much as someone else. I think we all need to stop that striving for more. We have very blessed lives and appreciating that takes a lot of pressure off us to try to have more. Inspiring words. Appreciating what we have is important as it's so very easy to focus on what we don't. Exactly - we already have so much and we need to put our focus on that, rather than what we think we are missing out on - be careful what you wish for! I hear what you're saying Nikki - your "mores" are a lot more altruistic than most people's. I think if people wanted more so they could help others then the world would be a different place - most want more so they can help themselves! This is such perfect timing. I've been coming to that point of finally understanding "enough-ness." 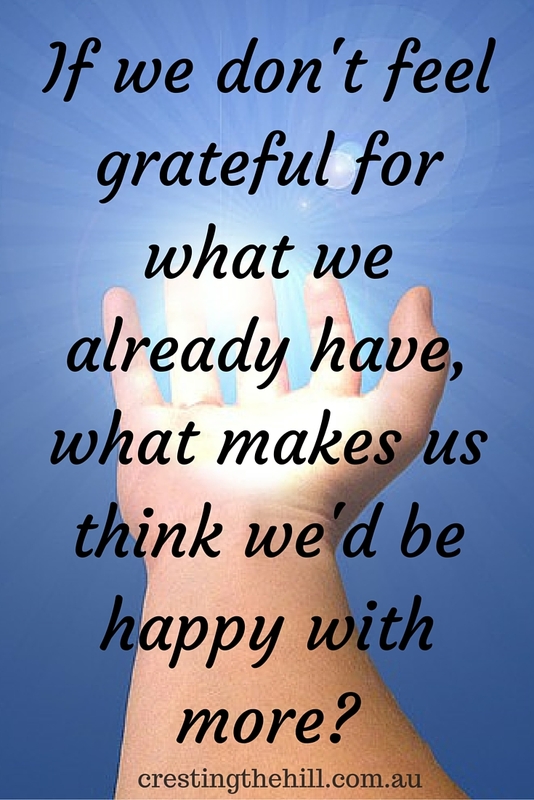 When you're thankful for what you have, you don't need or want as much of the shiny sparkly and new things. that's so true Jenn - we all have little things on our wish list but we need to find that sense of contentment with what we have. It gives us the ability to wait for those treats rather than expecting to have it all now.